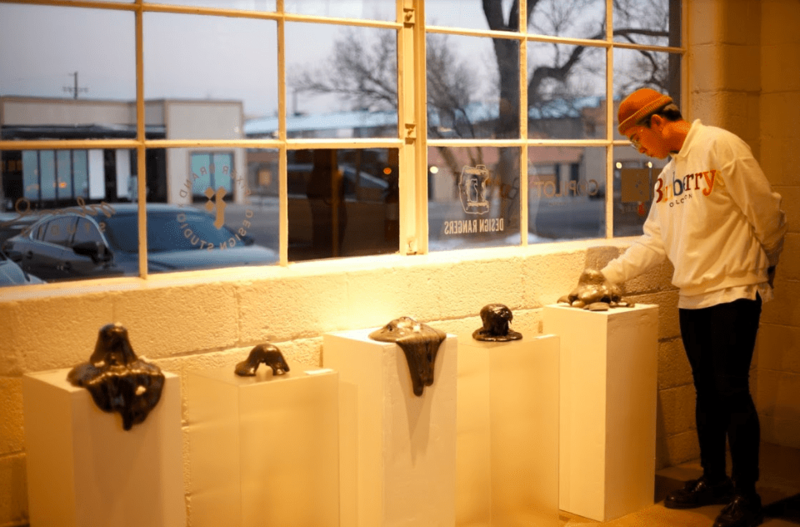 On the night of February 1, The Machine Shop held the opening of the first Friday art installation, RECALL by Su Kaiden Cho. When the guests entered the shop on opening night, they were greeted by the artist himself. Behind the artist stood months of planning, sleepless nights and craftsmanship. Five of the pieces were large coffee-cup size sculptures, shaped in distorted, masterful, solid blobs colored grey and black. The most curious thing about these sculptures was the intricately placed uric acid and white, foggy crystals resting on the smooth surface. When informing on the material he used, he said it was “uncontrollable,” in comparison to other art materials he’s used in past shows. Furthermore, this absence of control in the material presented in his artwork, Cho recounts this inconsistent process as him having a stronger connection to his work. The Machine Shop during the beginning of its time was under the blue collar reins of automotive workers. Fast forward a few years, and the shop now homes a collaborative office space to multiple companies specialized from architecture to brand design. Moreover, the shop welcomes select local artists to use the office space as a location to develop their next project in muse. Su Kaiden Cho, a graduate with a Bachelor of Arts degree in Interdisciplinary Arts Practices from UCCS, is currently the artist in residence at The Machine Shop. “The space is important to the artist because the space provides a shelter for the emerging (local) artist,” Cho shared when describing the challenges in his field. Since his graduation three years ago, Cho had been celibate in working on any other art project. That is, until the three month program “Artist in Residence,” offered by The Machine Shop, came knocking at the door, and Cho was motivated to rejoin his craft once again. Cho described the method to preparing for the exhibit in the following steps: “research, gathering materials, experimenting, creating” and finessing his work. The work executed by Cho originates from the inspiration he finds in the “disorientation” of his identity. Born in Seoul, South Korea and then migrating to the United States at nine, his work blossoms from the existential challenges of juggling his identity from one culture to the other. “The title RECALL, to me, was to regain back the identity that I had. I always have this invisible mask that no one sees, just so I can fit into American social norms. And whenever I go to Korea, I put on the Korean mask, just so that I can fit in with that community,” uncovered Cho. “It is okay to take off those masks and be who you are, whether they accept you or not. It is okay to voice out your opinion, it is okay to be who you are,” he expressed.